Regardless of it being a holiday based for Irish people, the parade started out in New York for the first time. How come? Many Irish emigrated to NY back in the 1760’s and this parade featured Irish soldiers serving in the English army. 4. 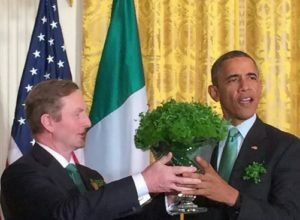 Traditionally, every year, the Irish leader hands a crystal bowl full of shamrocks to the US President. I don’t think you needed to read this blog to find this one out! But yes, it’s true – it’s a national holiday in Ireland and Northern Ireland on 17th March and it’s certainly a marked day on all of our calendars. The green, the guinness, and the parade all contribute to a great day! 6. It used to be a dry holiday. It’s always around this time of year that Irish-Americans come out from the wood work. Around 4.5 million Irish people emigrated to the US between 1840-1930 during and just after the Famine. So there’s a lot of people claiming partial Irish identity through their ancestors! So there you have it, some interesting facts you might not have known before. Wanna know why I’m bothering you with these silly Irish facts? Hear about my journey to SparkPost and why I came here from Ireland.